As a fan of epic fantasy, it's always interesting for me to read short fiction pieces from authors renowned for their doorstopper novels. As you are well aware, I'm a huge fan of Steven Erikson's The Malazan Book of the Fallen, and I found all the Bauchelain and Korbal Broach novellas but one to be quite appealing. So when this collection of three Erikson novellas came my way, I was curious to see what the author had to offer, especially given how disparate each tale appeared to be. And although I did enjoy The Devil Delivered and Other Tales, the book failed to captivate me the way the Malazan installments have done in the past. Each piece features a different style and tone which at times make it hard to truly get into the stories. Of course, Erikson was exploring a number of themes using various types of narratives. But in the end, it doesn't always work as well as it should. . .
“The Devil Delivered" tells a story set within the near future, where the land owned by the great Lakota Nation blisters beneath an ozone hole the size of the Great Plains. As the natural world falls victim to its wrath, and scientists scramble to understand it, a lone anthropologist wanders the deadlands, recording observations that threaten to bring the entire world to its knees. “Revolvo” takes place in an alternate Earth where evolution took an interesting turn and the arts scene is ruled by technocrats who thrive in a secret, nepotistic society of granting agencies, bursaries, and peer-review boards, all designed to permit self-proclaimed artists to survive without an audience. "Fishin’ with Grandma Matchie" is told in the voice a nine-year-old boy, writing the story of his summer vacation. What starts as a typical recount of a trip to see Grandma quickly becomes a stunning fantastical journey into imagination and perception in the wild world that Grandma Matchie inhabits. "The Devil Delivered" was by far my favorite tale in this collection. It's an apocalyptic science fiction piece in which Mother Nature evolves from the brink of destruction and strange mutations seem to be the only thing that could help save mankind. It's a dark and brooding piece which is hard to understand due to the fact that for the most part the motivations of the principal protagonist are not explained until we reach the end of the novella. The flashback scenes help us understand the present, yet for the better part of the story one keeps wondering where this is going. Using Saskatchewan as a setting was kind of neat. So was incorporating Native Americans and the vision quest concept. It was interesting to go back in time and discover how everything went downhill and why there appears to be little hope for humanity. "The Devil Delivered" may not be perfect, but it's the closest thing to a Malazan tale that you'll find within the pages of this collection. "Revolvo" is an absurb satire of what is likely the Canadian arts scene. Erikson seemed to have a bone to pick with the government's public founding of the arts and the tale that follows is a veritable tapestry of extremely bizarre plotlines. This novella is so "out there" that it's impossible to summarize it adequately in a few sentences. The narrative and dialogue are often quite witty and, though it's so strange you can never really tell what's going to happen next, the narrative is a lot of fun to read. "Revolvo" is brought to a decidedly weird and brutal ending that doesn't quite make any sense. But since nothing made much sense from the very beginning, it was the sort of unexpected ending this tale deserved. "Fishin’ with Grandma Matchie" made me think of Neil Gaiman's The Ocean at the End of the Lane. Granted, Erikson's novella cannot hold a candle to Gaiman's latest work, but it does explore some similar themes and motifs. The tale is told from a young boy's point of view and that narrative is a joy to read. The Nordic mythology underlying some of the adventures the boy embarks upon with his grandmother adds a bit of depth to what is for the most part a humorous and fun-filled novella. Again, the retelling of those mythological tales occurs in rural Canada. Which is kind of cool for Canuck readers. Given Steven Erikson's fertile imagination, it is no wonder that the author could come up with such disparate novellas. 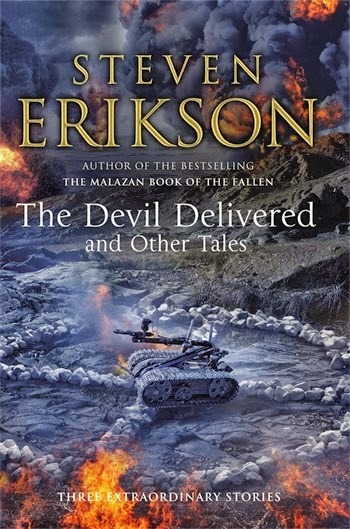 And for fans looking for something different to read while waiting for the release of the forthcoming Fall of Light, The Devil Delivered and Other Tales will allow you to discover different facets of Erikson's imagination and originality.